The R Type Bentley was a development of the Mk V1 Bentley and sported a 4.5 litre, six-cylinder engine and increased boot space; it was also the first Bentley to be offered with the option of automatic transmission. The R Type Bentley was produced from 1952-1955 and during this period only 2,320 were made, and probably only 1,100 remain worldwide. 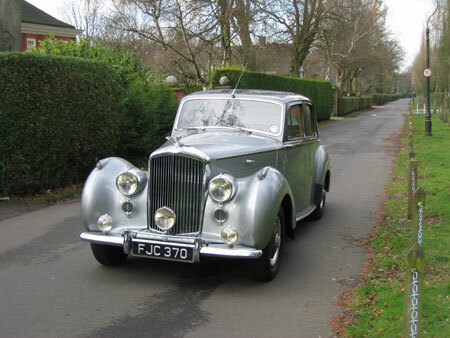 She was the fastest 4 door saloon money could buy in the 1950s with a top speed of 105mph. She is much sought after as a wedding car. Our car’s first owner was a circuit judge, Hon. Sir Henry Wynn Parry, but, perhaps better known, was its second owner, the actor Stanley Holloway, who won an Oscar for his portrayal of Eliza Doolittle’s father in My Fair Lady, in which he sang ‘Get me to the Church on Time’. Her livery is Tudor Grey over Shell, with a tan leather interior and toning Wilton carpets. There are side vanity mirrors in the quarters and walnut picnic tables in the front and rear.